A well-worn favorite on our bookshelf, Keeping A Family Cow, is out again in a revised and updated edition! Joann S. Grohman wrote the book back in the early 1970s, but it is just as relevant to greenhorns of today. Check it out at Chelsea Green. The cow is the most productive, efficient creature on earth. She gives you fresh milk, cream, butter, and cheese, and promotes human health and happiness. She helps the homesteaders and small farmers who offer her bounty up to the community with a chance at turning a profit. She provides rich manure for your garden or land, and enriches the quality of your life as you benefit from the resources of the natural world. Originally published in the early 1970s as The Cow Economy and reprinted many times since, Keeping a Family Cow is the book that launched thousands of holistic small-scale dairy farmers and families raising healthy cows in accordance with their true nature. 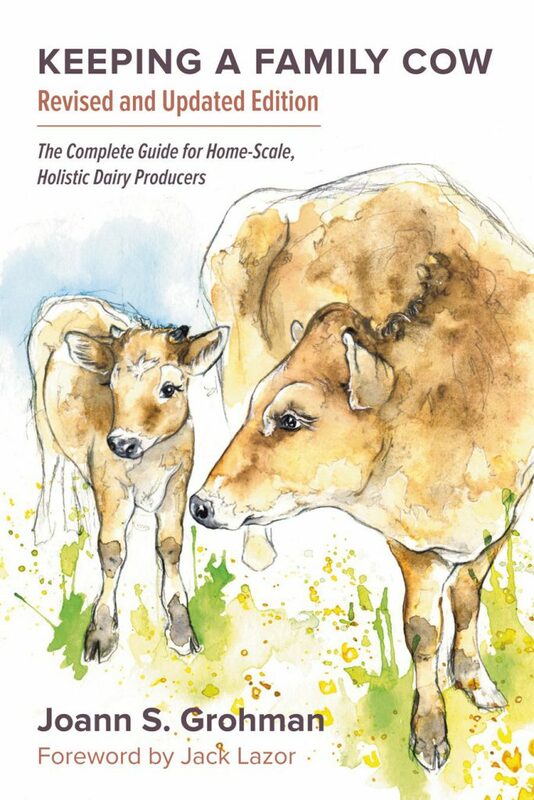 This Chelsea Green edition of a nearly forty-year-old classic has been revised and updated to incorporate new information on the raw milk debate, the conversation about A1 vs. A2 milk, totally grassfed dairies, practical advice for everyday chores, updated procedures for cow emergencies, and more. Making butter, yogurt, and cheese. Keeping a Family Cow not only has stood the test of time, but it remains the go-to inspirational manual for raising a family milk cow—nearly forty years after its first publication. Joann Grohman has a lifetime of practical experience that has been bound into this one volume and presented in the spirit of fun and learning. She started milking cows in 1975 and says she can no longer imagine life without one. Health and happiness can’t be teased apart, Grohman says, and a family dairy cow supports both of these essential life qualities. young & beginning farmer mixer!